A wide range of jigsaw blades made of bi-metal, carbon steel can fit into variety of well known jig saw such as BOSCH, METABO , DEWALT, MAKITA. Bi-metal one is used for cutting metal and non-ferrous metals and teeth shape & its teeth number per inch allows for quick cutting in hard plastic board, wood. Carbon steel one is designed for wood and non-metallic products. The ground & sharpened teeth can do clean and fast cut. 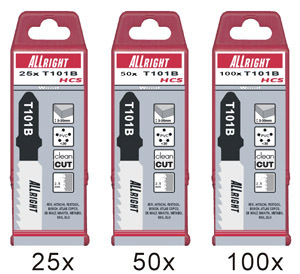 More than 100 kinds of jigsaw blades available below.